Lemon importers in the United States are enjoying a positive start to the year. Spain is currently a major exporter and source for the US and importers are enjoying good, steady supplies. These supplies from Spain will roll on until April, when the transition occurs to Latin American supply. "Right now, we are in the front end of our Spanish import season," said Ronnie Cohen of Vision Import Group. "There are currently good supplies from Spain and the season typically runs from December to April. After that, Argentine exports will commence again in late April and early May through to the end of June and perhaps into July depending on how the season progresses. In Mexico, there is one major growing region and their season generally runs from late July and early August through December/January, but there are a few other regions with a wider window, so we may see some lemons arriving from there as early as April, but in smaller volumes until the main season starts." Cohen added that the market is reasonable at the moment and growers are happy with the current prices. "It's a steady market, with prices around the mid $20s FOB in the Northeast which is pretty good money. The prices depend on the size and grade but the general range is between $24 and $28." It looks set to be a good year for US importers, with Spain providing reliable supplies at the moment and Argentina looking to build on the return to the US market last year after a long absence. Cohen observed that it's been a challenging year for California lemon producers, with a combination of high freight rates, natural disasters and general weather anomalies placing them under more pressure than previous seasons. He said this is leading to a more attractive market for Argentina. "We are able to cover our customers on the eastern seaboard with supplies from both Spain and Argentina," Cohen shared. "Argentina, being the world's largest producer of lemons, has the ability to supply the USA with high quality lemons – that can compete with our best domestic crops including California. Additionally, ocean freight rates are competitive and given the recent higher trucking rates from the West Coast, it's actually cheaper to ship lemons from Argentina by ocean carrier than from California by truck in many cases. This is providing Mexico an advantage as well due to their closer entry through Texas. Quality from Mexico each year continues to improve and can match California at this time, not to mention the difficulties that California growers are facing with labor issues and fires challenging the entire agricultural industry." Cohen predicts that Argentina will look to increase on the volume it sent to the US last year, but a measured amount that fills the markets needs while looking towards the future. "Argentina will be cautious again this year because they don't want to overload the US market and want to make sure they fit in well with the current setup," he noted. "We are very excited to work with Argentina as they enter their second year of returning to the US market." There have been some fundamental shifts in the lemon supply landscape in Europe, Cohen said. One of these revolves around Russia and the sanctions that have prevented it from doing as much business with Europe as in previous years. As a result, US importers are seeing better supplies from Spain - one of Russia's biggest suppliers before the sanctions began. "The good supplies from Spain are partially due to the fact that the dynamics in Europe have changed," Cohen explained. "There have been the issues surrounding trade with Russia, which was a lucrative market for many European producers, including Spain. 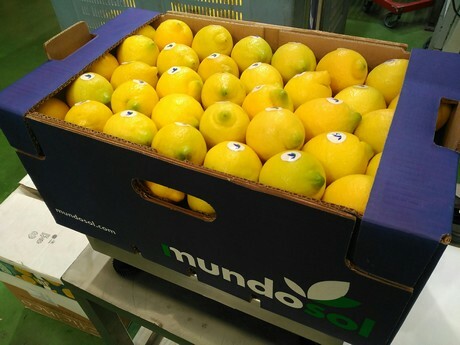 Therefore the playing field has changed and the growing demand in the US has given Spain an outlet for their lemon exports. Our Spanish imports are going to continue to grow in volume in the coming years, in order for us to be able to serve more customers."